This Employment Blog comes from the US Department of Labor, Bureau of Labor Statistics. The unemployment rate declined to 3.7 percent in September, and nonfarm payroll employment increased by 134,000. Job gains occurred in professional and business services, in health care, and in transportation and warehousing. Incorporating revisions for July and August, which increased nonfarm payroll employment by 87,000, monthly job gains have averaged 190,000 over the past 3 months. This summarized in Charts 1 and 2 below. Hurricane Florence made landfall on the East Coast on September 14–duringthe reference period for both the establishment and household surveys–causing large-scale evacuations and severe damage to many homes and businesses. Response rates for the two surveys were within normal ranges. It is possible that payroll employment in some industries was affected by the hurricane; however, it is not possible to quantify the net effect on employment. In September, employment in professional and business services increased by 54,000. Over the year, employment in the industry rose by 560,000. Health care added 26,000 jobs in September, with a gain of 12,000 jobs in hospitals. Over the year, employment in health care has increased by 302,000. In September, transportation and warehousing added 24,000 jobs. Job gains occurred in warehousing and storage (+8,000) and couriers and messengers (+5,000). Transportation and warehousing has added 174,000 jobs over the year. Employment in construction continued to trend up in September (+23,000). Over the year, construction employment has increased by 315,000. Employment in manufacturing also continued to trend up in September (+18,000), with a gain of 17,000 in durable goods. Over the year, manufacturing has added 278,000 jobs, most of which were in the durable goods component. Within mining, support activities for mining added 6,000 jobs in September. 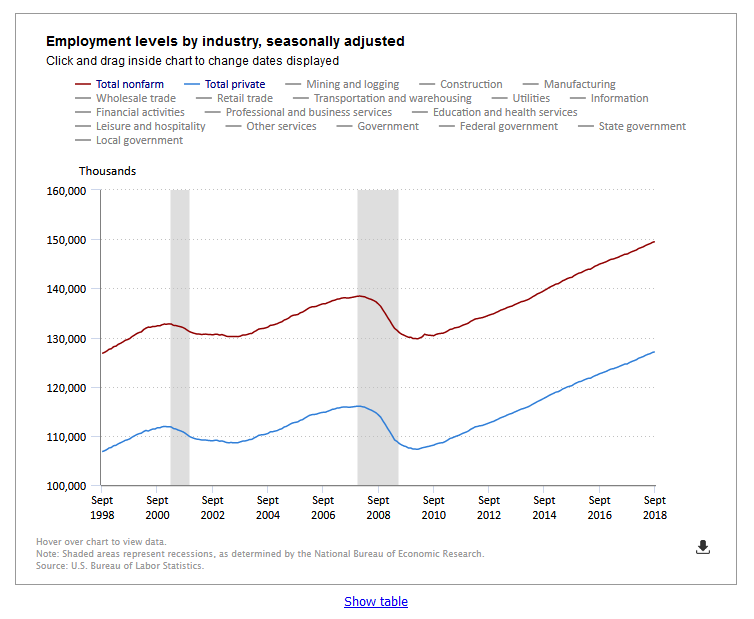 Employment in other major industries—including wholesale trade, retail trade, information, financial activities, and government–showed little or no change over the month. Average hourly earnings of all employees on private nonfarm payrolls increased by 8 cents in September to $27.24 . Over the past 12 months, average hourly earnings have risen by 2.8 percent. From August 2017 to August 2018, the Consumer Price Index for All Urban Consumers (CPI-U) increased by 2.7 percent (on a seasonally adjusted basis). Turning to measures from the survey of households, the unemployment rate declined by 0.2 percentage point to 3.7 percent in September. The number of unemployed people fell by 270,000 to 6.0 million, largely among adult women. Over the year, the number of unemployed people declined by 795,000, and the unemployment rate decreased by 0.5 percentage point. Among the unemployed, the number of people searching for work for 27 weeks or more was little changed at 1.4 million in September. These long-term unemployed accounted for 22.9 percent of the unemployed. The labor force participation rate held at 62.7 percent in September,and the employment-population ratio, at 60.4 percent, was little changed. In September, there were 4.6 million people working part time for economic reasons (also referred to as involuntary part-time workers). Although this measure was up by 263,000 over the month, it has been trending down over the year and is 506,000 lower than a year ago. Among those neither working nor looking for work in September, 1.6 million were considered marginally attached to the labor force, essentially unchanged from a year earlier. 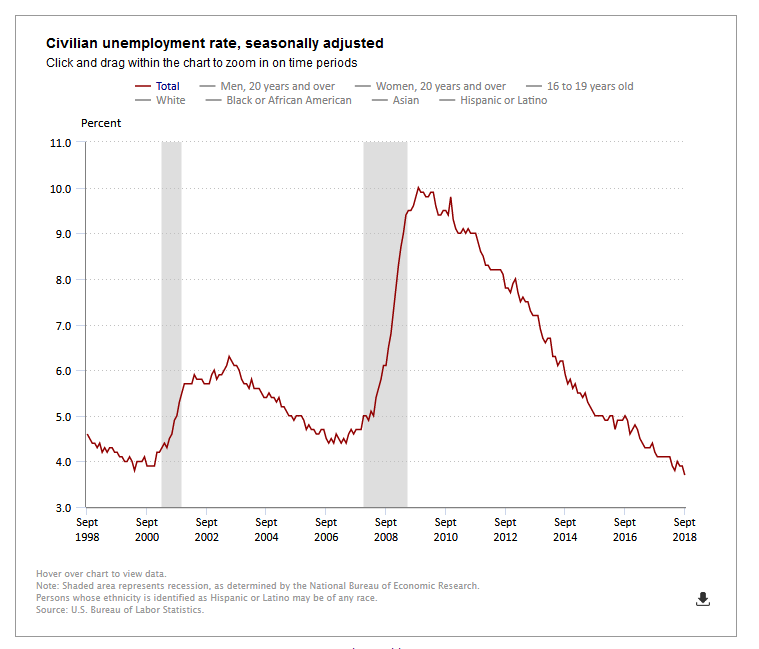 Discouraged workers, a subset of the marginally attached who believed that no jobs were available for them, numbered 383,000 in September, also about unchanged from a year earlier. (Marginally attached to the labor force refers to people who had not looked for work in the 4 weeks prior to the survey but wanted a job, were available for work, and had looked for a job within the last 12 months.) In summary, the unemployment rate declined to 3.7 percent in September, and nonfarm payroll employment increased by 134,000.